As it happens with each of us, the time came for me to change my tires. I noticed a great improvement after changing my trusty YBR's horrendous stocks to a set of Heidenau tires. No more unpredictable behaviour on wet tarmac. Yey! Anyway, after the German rubber wore out, it was time to try something French. I've heard great things about the Michelin Pilot Street – the little brother of Michelin Sport Touring for small to medium-size bikes. I fit a 2.75-18 and 100/90-18 onto my nifty '06 YBR 125. As with new running shoes, I start with new tires slow. I've noticed that there's barely any improvement in terms of handling at low speeds, it might be a simple limitation by the width of the tires, though. Such narrow profiles (i.e. 7 and 10 cm (2.75 and 4 in) and low weight in general make it really easy to maneuver but rather difficult to stay on a perfectly straight line. Having put in a decent 2500+ km on these tires, until now I must say I really like them. 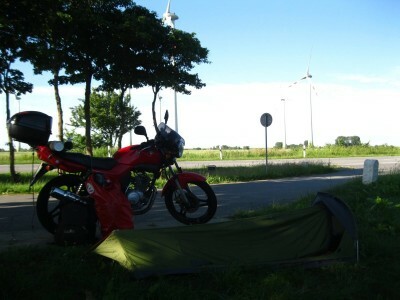 I encountered no problems on a round trip from Aalborg (Northern Denmark) to Amsterdam (The Netherlands), several trips out to the west coast of Denmark and some sneaky touring here, in rural Lithuania. Minimal signs of wear as of yet even though Michelin claim a high content of wet weather performance enhancing silica. One improvement that I did notice was their stickiness – it makes it really nice to approach bends and while leaning against side winds. That helps a lot as it's something all lightweight bike riders have to face and deal with. The Heidenaus did not boost my confidence with the slight wobbles once a gust would hit..
Optimistically, I thought that the Michelins would bring an economical gain, too. But alas.. Fuel consumption remained unchanged. Don't get me wrong, though. I'm good with the 30+ km/L (84+ MPG) that I'm getting.. Breaking is great both on dry and wet tarmac. And once on the gravel roads, I do feel more comfort at a slight loss of feeling compared to the previous Heidenau tires. Must be due to the radial design of these bad boys. Obviously they're not off-road or even dual-sport tires but now I need to worry less about each turn and bump. All in all, having compared three tires on this bike, I would highly recommend getting these Michelin Pilot Street tires for any lightweight motorcycle rider out there! Unless, of course, you can't let those gravel roads go.. Will try the Heidenau K60 Scouts myself next time!